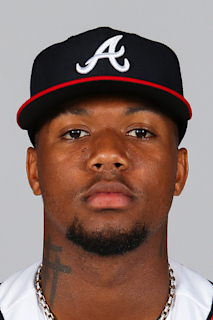 Fullname: Ronald Jose Acuña Jr.
His father, Ron, played the outfield in the minors for three different organizations: New York (NL) from 1999-2004, Toronto in 2005 and Milwaukee in 2006...His grandfather, Rosmaldo "Romo" Blanco was a pitcher in Houston's system. Finished his first major league season hitting .293 (127-for-433) with a team-high 26 home runs and a .917 OPS in 111 games...Won the National League Jackie Robinson Rookie of the Year Award, collecting 27 of 30 first-place votes to become the eighth Braves player to earn the honor ... Entered the year as the No. 2 overall prospect according to MLBPipeline.com and began the season with Triple-A Gwinnett…The club selected his contract from the Stripers on 4/25 and he made his MLB debut that night at Cincinnati at the age of 20 years, 128 days...He became the youngest player to debut for the Braves since Julio Teheran debuted at the age of 20 years, 100 days on 5/7/11...The last younger position player was Wilson Betemit in 2001...Betemit debuted at 19 years, 320 days ... Singled in his debut against Kevin Shackelford for his first career hit, before hitting his first homer the next day off Homer Bailey in his first plate appearance...Acuña Jr., at 20 years, 129 days, became the youngest player to homer for the Braves since Andruw Jones hit a solo shot on 8/23/97 vs. Cincinnati at age of 20 years, 122 days ... Hit eight leadoff home runs to set the franchise single-season record and pass the previous mark of seven, set by Marquis Grissom in 1996 ... Became one of five players in baseball history to reach 26 home runs in a season prior to his 21st birthday (Mel Ott, 42 in 1929; Frank Robinson, 34 in 1956; Tony Conigliaro, 32 in 1965; Al Kaline, 27 in 1955)...Became the 10th player in history to have 25 home runs and 15 steals in his rookie season and the first since Mike Trout in 2012 ... Homered in five straight games, 8/11-8/14, to tie the franchise modern-era record for most consecutive games with a homer...Hit six total over his stretch...Prior to Acuña Jr., the last Braves player to homer in five straight was Brian McCann in 2006...Acuña Jr. became the youngest player in baseball history to homer in four straight games ... Made starts at all three outfield positions (13 games, 8 starts in center field; 101 games, 96 starts in left field; 3 games, 3 starts in right field) ... Collected 55 extra-base hits through his first 100 games...Over the last 110 seasons, only five players in history had more through 100 games, including Joe DiMaggio, who had a record 69 ... Finished August with 39 hits, becoming the first N.L. rookie over the last 110 seasons to collect at least 39 hits and 11 home runs in a calendar month...Won the N.L. Rookie of the Month award for August...Also named as the N.L. Player of the Week for the week ending August 19 ... His streak of three consecutive games with a lead-off home run ended, 8/15, after he was hit with the first pitch by José Ureña…He became just the second player with as long a streak in baseball's modern era; Baltimore's Brady Anderson holds the major league record with four straight, accomplishing the feat from 4/18-21/96 ... Coupled his first career home run on 4/26 at Cincinnati with one by 2B Ozzie Albies (21 years, 110 days) to become the second pair of teammates as young as Albies or younger in the franchise's modern era to homer in the same game...The only other time was on 9/23/78, also vs. CIN...Glenn Hubbard and Bob Horner each hit a solo shot that day ... By combined age, Albies and Acuña Jr. were 41 years, 238 days old on 4/26... The last major league duo younger by combined age to homer in the same game was Ricky Seilheimer (19 years, 331 days) and Harold Baines (21 years, 133 days) for the White Sox on 7/26/80... Seilheimer and Baines were 41 years, 99 days ... Using players as young or younger than Albies, the previous duo younger by combined age to homer in the same game was Philadelphia's Mike Anderson and Greg Luzinski on 8/28/71...The two 20-year-olds each went deep in a 6-3 win vs. PIT ... Albies and Acuña Jr. both added doubles in that game...Again, using only players as young or younger than Albies, the only other duo since at least 1908 to homer and double in the same game was Boston's Ted Williams and Bobby Doerr on 7/4/39 in game one of a doubleheader against Philadelphia (AL) ... Named to the MLB team that played in the 2018 Japan All-Star Series in November…Finished 5-for-24 (.208) with a home run in five games ... Hit a two-run homer in the 11th inning, 7/3 at NYY, to give Atlanta the 5-3 win...With his game-winning homer, became the only player to hit a game-winning extra-inning home run at Yankee Stadium prior to his 21st birthday...Prior to Acuña Jr., the youngest player with a game-winning extra-inning home run at Yankee Stadium was MIN's Kent Hrbek (21 years, 95 days) on 8/24/81 ... At 20 years, 196 days, became the youngest player to hit a game-winning, extra-inning home run for the Braves since Andruw Jones (20 years, 3 days) on 4/26/97 vs. SD ... Led off in the starting lineup for the first time in his career on 7/20 at WSH in the first game out of the All-Star break...Went 3-for-4, while hitting a home run and robbing one in the fifth inning...Also stole two bases, and at 20 years, 214 days, became the youngest player in baseball's modern era (since 1900) to homer and steal two bases in the same game ... From 8/11-17, reached in eight consecutive plate appearances leading off the game...That is the longest such streak in Atlanta franchise history, surpassing a six-game run by Martín Prado, 5/11-16/11 ... Homered to begin the streak on a Saturday, walked on Sunday, homered in each end of Monday's doubleheader, homered again on Tuesday, was hit by a pitch on Wednesday, and singled on Thursday and Friday ... His run became the longest leading off the game since the New York Mets' José Reyes also had an eight-game streak, 6/24-7/2/11 ... On 8/13 vs. MIA, became the fourth player to ever hit leadoff home runs in both ends of a doubleheader and the first to do so since 8/21/99, when Baltimore's Brady Anderson accomplished the feat against the Chicago White Sox ... Became the first National Leaguer to ever do so, as the other two players to hit leadoff home runs in both games of a doubleheader were Oakland's Rickey Henderson (1993) and Boston's Harry Hooper (1913)...Hooper hit four home runs that season...Both Henderson and Hooper are in the Hall of Fame ... Hit .322 (85-for-264) in 68 games after the All-Star break, with 19 home runs, 54 runs scored, a .403 on-base percentage and a .625 slugging percentage...His 85 hits were the second most in the majors post-break, while his 54 runs tied for the second most and his 19 home runs were tied for fourth most...His 1.028 OPS was the fifth highest ... Became the youngest player in baseball history to hit a grand slam in a postseason game when he did so in the second inning of Game 3 of the NLDS vs. Los Angeles…Prior to his slam, New York's Mickey Mantle was the youngest to hit a grand slam in the playoffs, doing so at the age of 21 in Game 5 of the 1953 World Series against Brooklyn ... Acuña Jr.'s slam, which came on a 3-1, second-inning pitch from Walker Buehler, was the seventh in Braves postseason history and the first since Adam LaRoche hit one in Game 4 of the 2005 NLDS at Houston…It also marked the first slam of Acuña Jr.'s career. Played 30 games with Single-A Rome to open the season and batted .300 (33-for-110) with a .389 OBP before being placed on the 7-day disabled list on 5/10 with an injured thumb… Activated from the DL on 8/26 after a two-game rehabilitation stint with the GCL Braves ... Ended his first full professional season batting .311 (46-for-148) in 40 total games with Rome… Swiped 14 bases in just 42 total games, good for ninth-most among Braves farmhands ... Batted just .154 (4-for-26) with three runs and three RBI in seven postseason games, but three of his hits went for extra bases (one double, two triples) as Rome won the South Atlantic League Championship Series ... Named by Baseball America as the No. 12 prospect in the South Atlantic League at the conclusion of the season ... Entered 2016 tabbed by Baseball America as Atlanta's No. 28 prospect. Split his first professional season between the GCL Braves and rookie-level Danville at 17 years old, combining to hit .269 (54-for-201) with 22 extra-base hits and 18 RBI in 55 games ... Ended the season in the Top 10 among all Braves farmhands in OPS (5th, .818) and stolen bases (T8th, 16) ... Exited the year tabbed by Baseball America as the 11th-best prospect in the GCL and the 14th-best farmhand in the Appalachian League ... Fell a home run short of the cycle in his second professional game, going 3-for-4 with four runs and an RBI. ARI@ATL: Acuna crushes a 114.3-mph home run 448 ft.
June 28, 2018 Atlanta Braves activated LF Ronald Acuna Jr. from the 10-day injured list. June 22, 2018 Atlanta Braves sent LF Ronald Acuna Jr. on a rehab assignment to Gwinnett Stripers. May 28, 2018 Atlanta Braves placed LF Ronald Acuna Jr. on the 10-day disabled list. Left knee contusion and mild ACL sprain. April 25, 2018 Atlanta Braves selected the contract of LF Ronald Acuna Jr. from Gwinnett Stripers. January 26, 2018 Atlanta Braves invited non-roster OF Ronald Acuna Jr. to spring training. July 13, 2017 CF Ronald Acuna Jr. assigned to Gwinnett Braves from Mississippi Braves. May 9, 2017 OF Ronald Acuna assigned to Mississippi Braves from Florida Fire Frogs. April 4, 2017 OF Ronald Acuna assigned to Florida Fire Frogs. February 25, 2017 OF Ronald Acuna assigned to Atlanta Braves. August 26, 2016 Rome Braves activated CF Ronald Acuna from the 7-day disabled list. August 22, 2016 Rome Braves sent CF Ronald Acuna on a rehab assignment to GCL Braves. May 12, 2016 Rome Braves placed CF Ronald Acuna on the 7-day disabled list. April 4, 2016 CF Ronald Acuna assigned to Rome Braves from Danville Braves. August 11, 2015 CF Ronald Acuna assigned to Danville Braves from GCL Braves. June 22, 2015 CF Ronald Acuna assigned to GCL Braves.